"I prefer to act my parts on a painter’s platform. The actor dies and is forgotten. I live for hundreds of years – maybe thousands – in the famous paintings in which I appear." In 1924, Los Angeles Times writer Carl Clausen said, "To be the original of scores of masterpieces, to be the inspiration of masters and the friend of the great ones of the earth is more than a distinction. Such is the good fortune of Antonio Corsi, the world’s most famous living artist’s model." Corsi’s face and figure was painted, sketched and sculpted by the likes of such great artists as John Singer Sargent, Pierre Auguste Cot and James Earle Fraser. There are statues and reliefs of Corsi found in New York’s Battery Park, The Metropolitan Museum of Art, St. Pauls Cathedral in London, and countless other locations around the globe. The first series of Pygmalion paintings by Edward Burne-Jones, which Corsi posed for, is currently in the collection of composer Andrew Lloyd Webber. 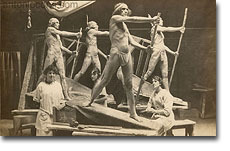 The New York Times commented, "In [the] sculpture by the Princess [Louise] of ‘The Crucifixion’ and in representations of the same subject by painters, Corsi accomplished what was perhaps his finest and most pre-eminent work as a model… As elsewhere in his long career, the excellence of achievement was largely due to his imaginative concentration." "I live, I breathe, I feel all of the emotions of the characters I assume. When I posed for the Crucifixion I lived over again the anguish and suffering of Jesus." Corsi died 1924 at the age of 56. An opportunistic silent film actress liquidated his assets. The following decades saw Corsi’s legacy slip into obscurity. Corsi, through energetic self-archiving, marked own his place in history. He not only lent his image to famous works of art that will survive hundreds of years, but kept a record of his own life in hundreds of recently rediscovered photographs and documents. Over the course of 8 years of research, filmmakers Jake and Tracey Gorst have reconstructed Corsi's life history. Mainspring Pictures is proud to introduce the life and work of this ingenious artist’s model to the public in a new feature documentary. Learning about the life of Corsi will encourage the world to take a fresh look at the works of Sargent, Abbey and many others. By discovering Corsi, many will discover new ways of seeing the art of that era. An extended preview of Corsi: The World’s first super model.